So, gnocchi. So much to say!! Firstly and most important, Sister made a wonderful surprise home this week. Marcus and I were in New Zealand and I received an email from Sister, who is a student on the east coast of Canada. Sister is coming home! She gets home the day after we get home from New Zealand, and we hatch a plan to surprise our Mum and Dad. The excitement builds, and a terribly-kept secret bubbles over into a story about a “great gift from the airport”…and then, Sister pops out, Mum and Dad are shocked, and happy, happy days. Sister is like a cool version of me. You know, like a seven years ago version? ‘Cause she’s literally seven years younger? She wears high waisted jeans and lives alone in an apartment where she makes galettes, and plunger coffee, and doesn’t have a TV. Sister likes wine, and braids in her hair, and Pippy. She is smarter than I would ever wish to be, and has excellent taste in wine and food and dogs. I made gnocchi once before. It was a complete failure. The whole “salt your boiling water” I took WAY too literally, and mushy, inedible potato blechs insued. My girlfriend Manders was visiting me up north and I was somewhat determined to make this gnocchi work. It didn’t. I don’t remember what we ended up eating for dinner that night, but it certainly didn’t live up to my Italian, pillow-y, delicious nugget expectations. Sister has made this gnocchi loads of times. She’s made it for our parents, she’s made it for herself. She’s made it for Marcus, the machine. It is GOOD. This gnocchi is so soft, yet crispy on the exterior. I am dying to make it for company. Sister’s gnocchi will make any casual dinner guests your best friends by the end of the evening. You know how fresh perogies are good? But fresh perogies boiled then lightly fried with fresh herbs are amazing? This is the same thing. Friends: fry your gnocchi. 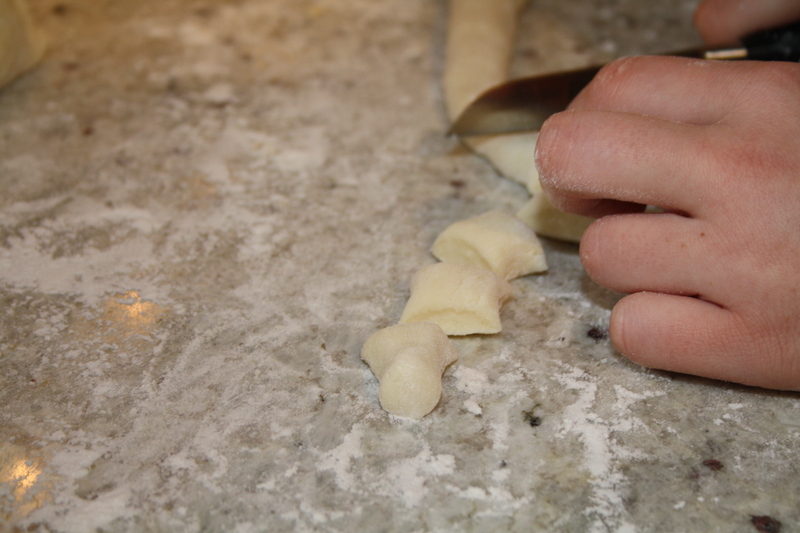 Traditionally, one would use a gnocchi press or fork to create indents on the potato dumpling. It is pretty, yes. It helps the sauce adhere to the gnocchi, yes. But is it completely necessary? No. If you are cutting steps or making this for for a delicious, quick family meal? Skip this step. I knew Sister was coming home several days before our Mum and Dad did. 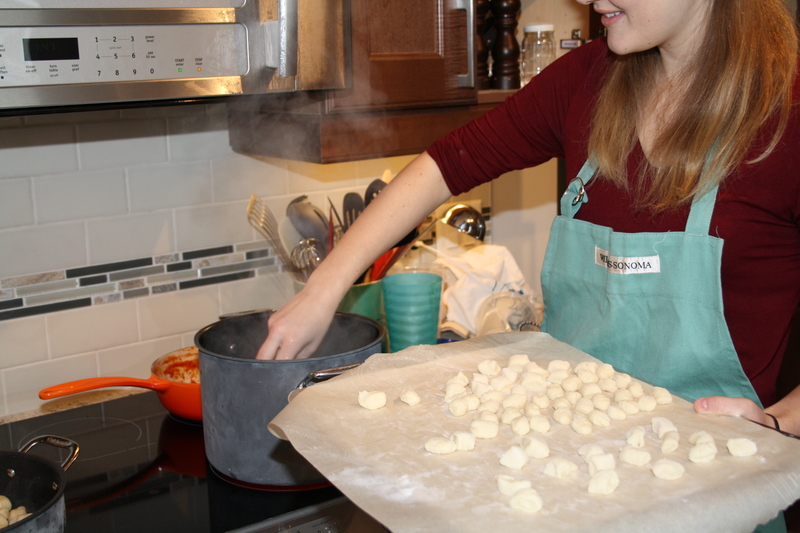 I wrote her an email, and it simply said: “Should we make something for the blog when you’re back?” She replied, “yes, we should make gnocchi”. Sister said: “When I serve it I like to lightly fry it after boiling them, so that they get this nice, golden, crispy edge, but are still really soft and light in the middle. And from there you can either top it with tomato sauce or pesto. Or you can add oven-roasted veggies, olive oil, and (lots of) parmesan cheese”. So I was thinking, as much as I love pasta primavera, it is winter back home. I would really just like sauce and cheese, yah know? 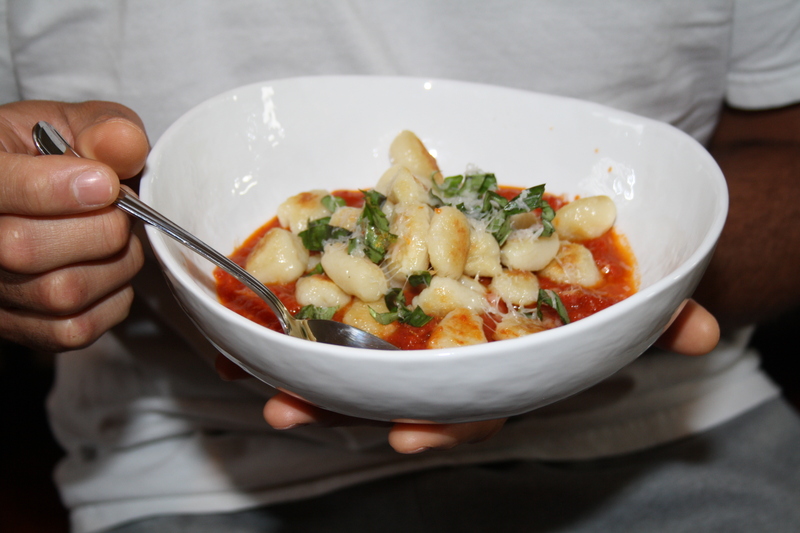 I remember buying gnocchi from the grocery store, and it simply, does not compare. You can’t do it. Fresh is best, it can be time consuming but when you freeze the leftover dumpling it is so, so worth it. In Marcus currency, he would pay $18 for this. It is so, so good. The sauce is velvety and tart and complex. On any noodle, it would be divine. The gnocchi – oh, the gnocchi. It’s everything gnocchi is supposed to be. Soft, crisp on the outside, comforting…with the tomato sauce and basil both indulgent and light. Really, really delicious. Only the way Sister can make it. Pierce potatoes with a fork or knife, and microwave on high for 15 minutes, turning over every 5 minutes. Start the tomato sauce. 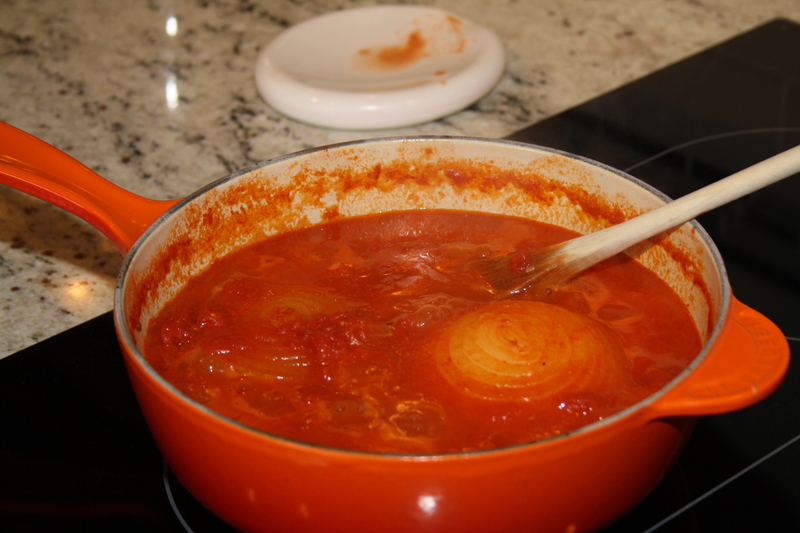 In a saucepan, combine the can of tomatoes and its juice with the butter and onion halves. Over medium heat, bring the mixture to a simmer. Cook, uncovered, for anywhere from 30-60 minutes, stirring occasionally and mashing any tomato pieces against the saucepan with a spoon. 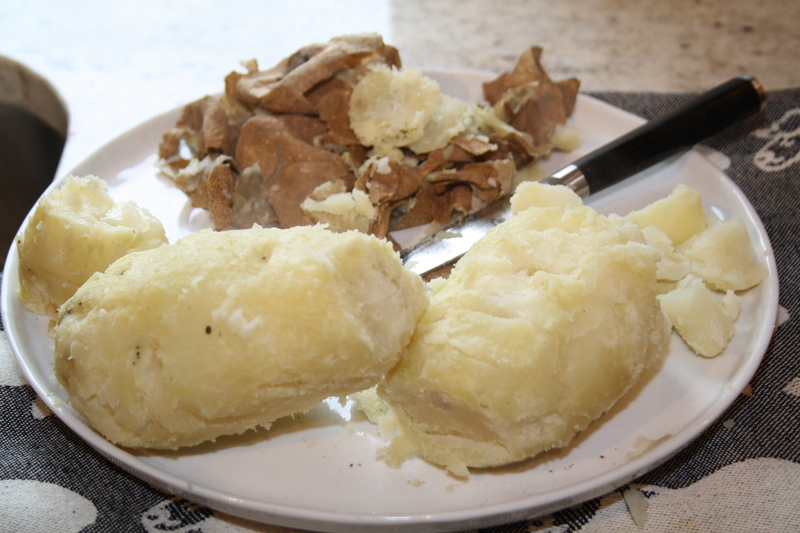 When the potatoes are cooked through and slightly cooled, peel them with a knife and discard of the peel. 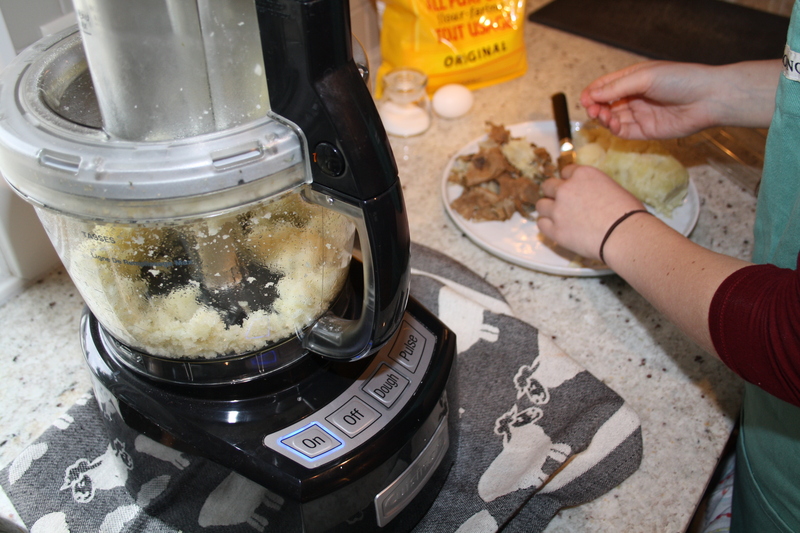 On the grate setting of a food processor, run your potatoes through the machine. 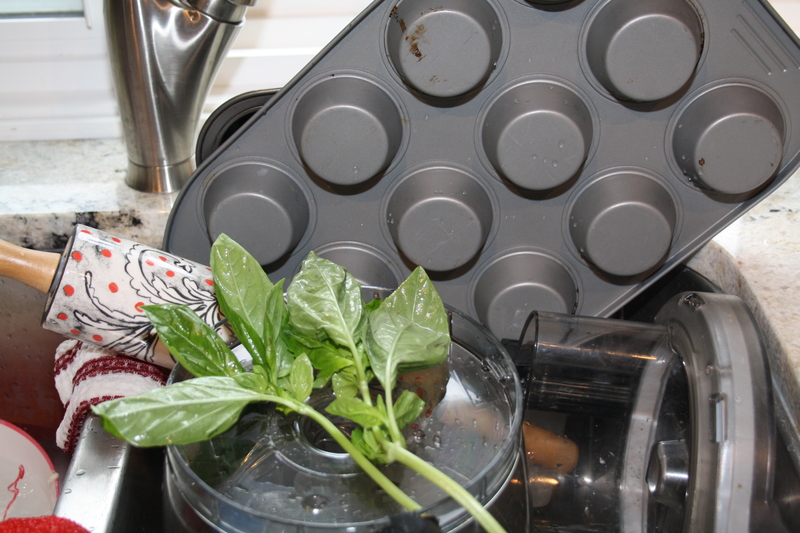 You can also use a potato ricer or hand grater, but it won’t be as easy :). Add the egg and salt to the potatoes and stir to combine. Add a 1/2 cup of flour and stir, then another 1/2 cup of flour to combine. 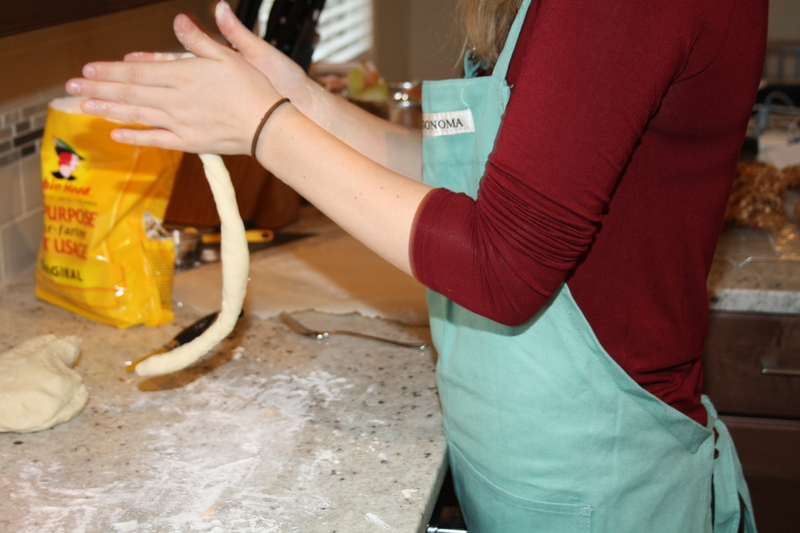 Add another 1/2 cup of flour and start kneading the mixture to see if it forms a ball without sticking to your hands. If it doesn’t, add another 1/4 cup flour a little bit at a time until the dough is soft and able to hold it’s shape. Knead the dough for 1 minute and then divide into quarters. In a large pot, begin boiling some salted water. Starting with the first quarter of dough, roll it into a long rope until its about 3/4 inch thick. Cut a 3/4 inch piece off each rope, and then use a fork to give each piece it’s traditional ridges. You don’t need to do this, so if you’re opting for a less-traditional snip just skip this step and place the pieces on a parchment-linned baking sheet. In a large pan, drizzle a small amount of olive oil over medium heat. 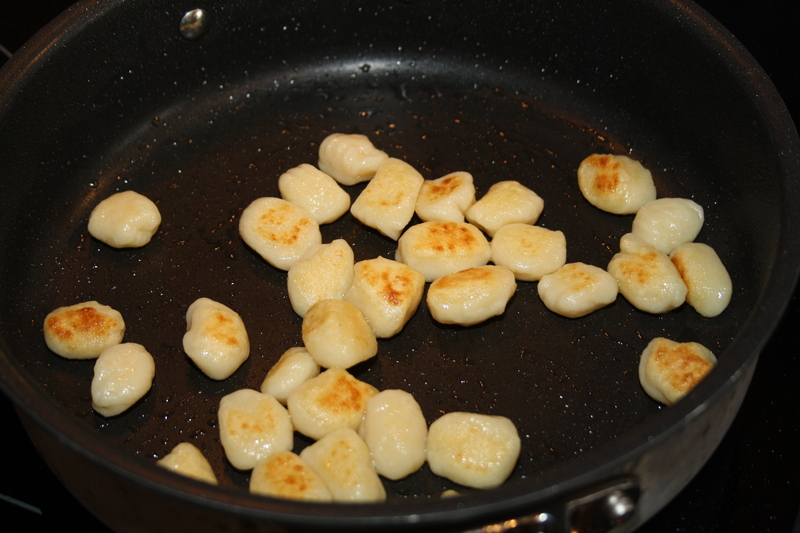 Using about a third of your prepared gnocchi, place about it in your boiling water for about 3-4 minutes. 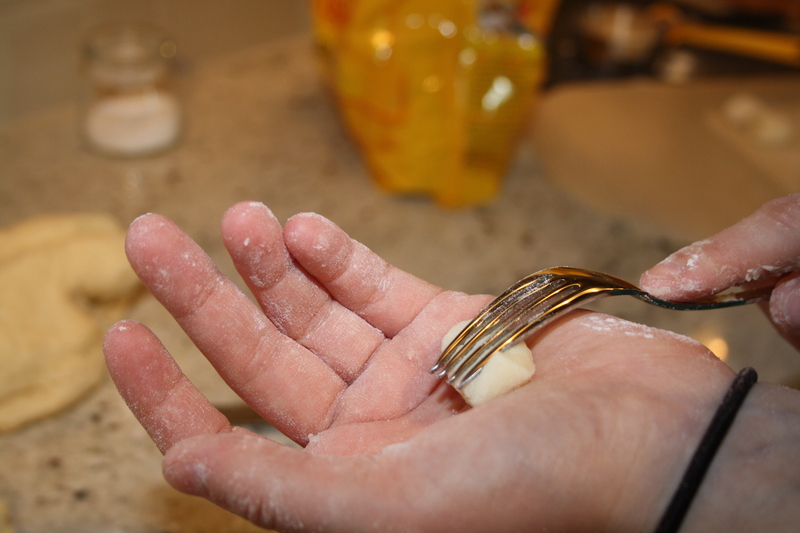 Using a spider spatula or slotted spoon, lift the gnocchi out of the water and transfer directly to your hot pan. Toss and shake your frying gnocchi until it gets a lovely brown crisp on both sides. Once the first batch of gnocchi is golden to your liking, take the onion halves out of the tomato sauce using tongs. 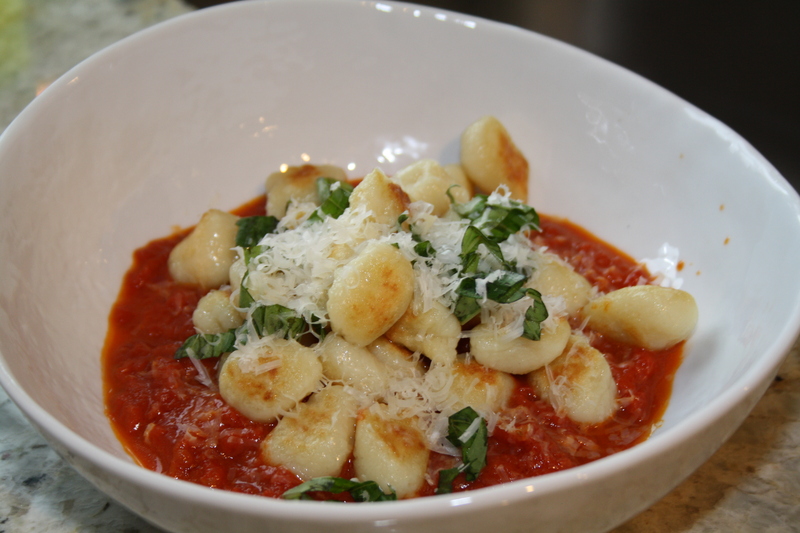 Spoon some sauce in a shallow bowl, then drop some lovely, crisp gnocchi over with fresh basil and grated parmesan. 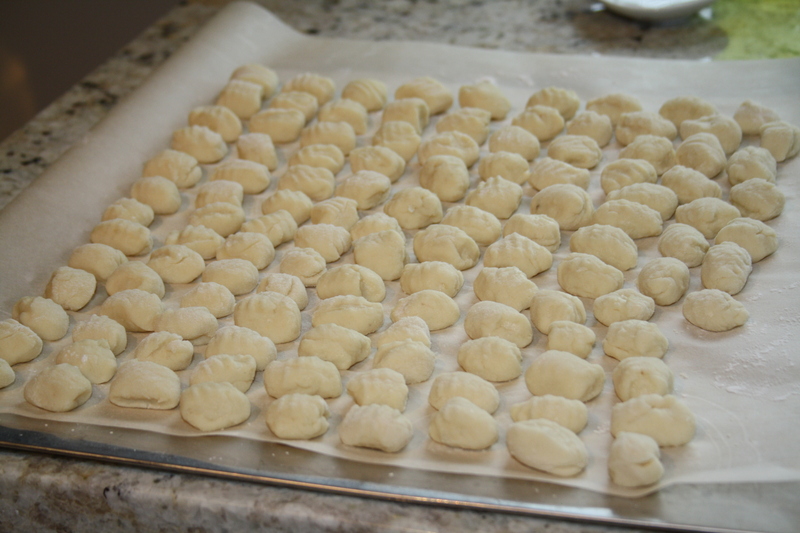 Continue these steps until all gnocchi batches are cooked, sauces, and garnished to your liking.